Congratulations to the 16 students who were named Illinois State Scholars for 2019! We are proud of your achievements and thrilled that you have been recognized by the state with this honor. 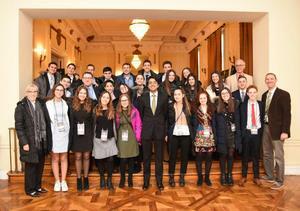 Rochelle Zell Jewish High School received the National High School Model UN Team Conference Award of Distinction for the 5th consecutive year at the 45th annual NHSMUN 2019 Conference in New York. Click read full story for individual awards and plenary session speakers. 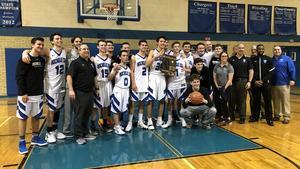 RZJHS Collects Fourth Regional Title in the IHSA Basketball Championship! Almost all of the Class 1A and 2A regional title games took place Friday night, but that would not have worked for Sabbath-observing students of Rochelle Zell and Yeshiva. IHSA assistant executive director Matt Troha said an accommodation was made for the two Jewish schools from Deerfield and Skokie that allowed them to play later Saturday night, after the Sabbath had ended. The RZJHS math team placed first in our division for the year at a thrilling meet, moving up an unbelievable 22 places in rank since last year! 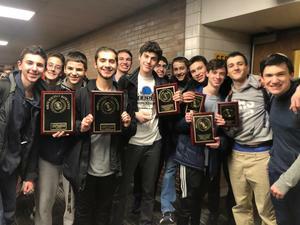 “We had an incredible last meet of the season at Glenbrook South High School, competing alongside over 50 high schools from around the area," adviser Ms. Abramson reports. "The team did us proud, with most students competing well over and above their grade level. Our hardworking sophomores and juniors came in first place in competition, while our freshmen and seniors finished third. We also won the Most Improved Team award for moving up 22 places since last year!" Jonah Magill proudly represented Rochelle Zell Jewish High School against 15 larger Division 1 & 2 schools in the Coach Roy Fleet Track and Field Invitational at the De La Salle Institute in Chicago. This time Jonah brought home the gold for RZJHS in the 60 Meter Hurdles, finishing over one full second faster than his closest competitor. Jonah's recent performances have advanced him to the Number Two Ranking in the 55 Meter Hurdles in Illinois, Division 1A. 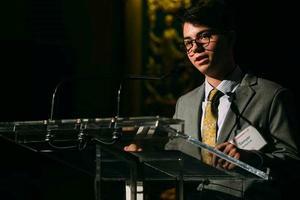 Yasher koach to finalists Micah Stern and Leora Karoll, for the Response for Teens 2019 Extraordinary Adolescent Award. Response for Teens is a JCFS Chicago program specifically devoted to supporting adolescents (ages 12 through 24) and their families in the Jewish and general community. 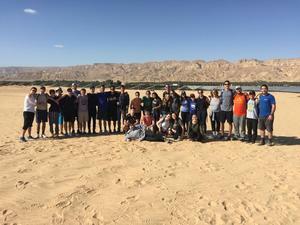 The Class of 2019 is in Israel! 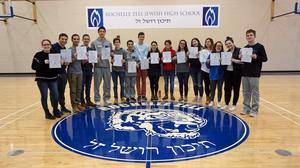 Check out the Rochelle Zell Senior Israel Experience blog often to see pictures and stories. Mazal Tov RZJHS senior Samantha Brody on her new position. CHUSY is the Chicago-based region of USY and includes local chapters from Chicago as well as Madison and Milwaukee, WI and Northwest Indiana. Mazal tov to senior Sawyer Goldsmith for being honored with Keshet's Hacham Lev Award. The award recognizes Sawyer's many accomplishments throughout the Jewish world, including Keshet, USY, and RZJHS.